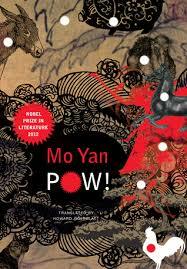 The latest addition to my website is Mo Yan‘s 四十一炮 (Pow!). This story follows Mo Yan’s usual style – conflict in his small town. In this case, our narrator, the meat-obsessed Luo Xiaotong lives with his parents. His father, Luo Tong, runs off with another woman. His mother, Yang Yuzhen, is determined to succeed without him and soon runs a flourishing recycling business. When a contrite Luo Tong returns, with a young daughter, after the death of his mistress, he is reluctantly accepted back. He is even appointed manager of the new meat packing business by his former enemy, Luo Lan, the village headman, though it is his now twelve-year old son who shows the most creativity at the plant. However, it is not going to go well and we get lots of blood, guts and gore, and not just from the animals at the meat plant. As always, it is funny, a good story and often unpredictable as to where it is going.